This game progresses by button operation. It is a game series where two people can play against one device. If you play with your body in close contact, the match will be more fun. Any two partners, including parents, friends, lover, etc, are suitable. Because it is simple and rules that everyone knows, you can start the game immediately on the spot. If you use the handicap function you can match the level of the two people. Because the match-up time is short, I can play anytime and anywhere when I feel like it. Of course there is also a 1P play mode for one's time. The rule is simple. Just merging blocks of the same number. Simple and timeless game nature keeps fascinating people all over the world. 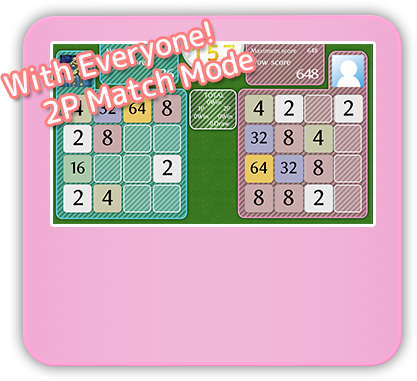 Physical Contact: 2048 is a game system that can fight in versus mode. Enjoy the Physical Contact: 2048 with new versus system. There are two modes of a mode that aims at the each block time-attack mode and a mode that challenges a tower of 100 floors. In the tower, the squares also increase! You can play with one Nintendo switch! Judge is determined by the score obtained by coalescing blocks. You can get coins by playing games or make the achievements. A Coins can to purchase wallpaper, avatar. Please aim for completeness by all means. © 2017 Collavier Corporation. All rights reserved.